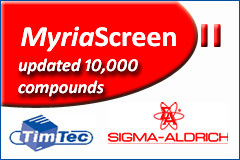 TimTec Diversity Screening Set of 10,000 samples is our most popular competitively priced collection of 10,000 most diverse compounds selected from TimTec stock of over 180,000 compounds. Diversity Set stands out having diverse selection of singletons identified in TimTec stock pool of readily available compounds. In addition, it is also a compound collection that complies with Lipinski Rules of five. If your assay can handle 10,000 molecules and you are open to exploring structural variations, Diversity Set is the great precursor to Discovery. 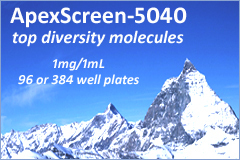 Diversity Set is available in 96-well or 384-well plates formats. Each plate in the Set shares overall diversity of the entire compound collection and can be purchased individually. 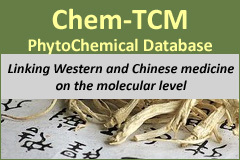 Receive a copy of any of TimTec compounds collections on a CDRom - please e-mail your exact postal address.